And don’t miss the video clip of an 11-year-old girl hanging up on her grandmother! 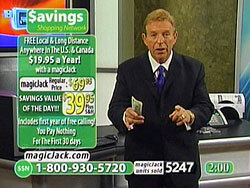 My partner and I purchased the Magic Jack not very long after the informercial began airing and it’s been great. Saved lots of money with it. The only major problems are that: 1) the results are less-than-desirable with DSL connections (at least the DSL connections WE’VE experienced) or connections that aren’t strong (callers’ voices break up to the point of gibberish), and 2) there is ZILCH in the way of customer service – all that is offered is one of those frustrating “online chat customer services”, which I have never found even remotely useful. I agree the infomercial fairly screams “RIP-OFF!” but the product really DOES work. That was an incredible infomercial. The worst part is that Magic Jack actually is really cool, and they totally ruin their own credibility with such an idiotic presentation. PS I edit electrical engineering journals for a living, so I discovered a few months ago that Distinguished Member of Technical Staff (DMTS) is an official title given to certain researchers at Bell Labs (it’s one step up from just being a Member of Technical Staff). I think other companies have these titles as well, but it’s mostly in the engineering sector from what I’ve seen. The service is horrible. I was online with the so-called tech for HOURS and a minor problem turned into the whole thing being deactivated and they can’t tell my why. They don’t want to give a refund (after 30 days) and I have absolutely no phone service until they send another device and we start the whole process again. DON’t get one until they get the bugs out. May be a while. Best line in the whole infomercial, although the little girl hanging up on her grandmother is right up there. If I got a call from my grandchild at 3:30 in the morning saying hello and then hanging up; I would be pretty upset. Or concerned.